Custom Engineered Returnable Racks STO009 | EGA Products, Inc. 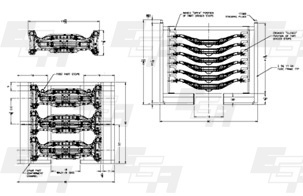 When this Tier 1 automotive supplier specified a transport rack for their rear-suspension assemblies, they were precise. The racks needed to be both returnable and ergonomically designed to minimize worker fatigue. EGA designed and built custom stackable racks that allow random loading at the supplier, and permit easy random unloading at the automotive assembly line. And because the racks protect all painted surfaces during transit, expensive packaging is eliminated, as well as the considerable time and expense of its disposal. Protecting the precision painted, front fork assemblies of motorcycles went beyond the abilities of conventional disposable protective packaging and shipping methods. So when it was time to ride, this manufacturer chose EGA custom engineered returnable racks for interplant transfers. The solution accommodates a variety of subassembly sizes. Simple, easy-to-use locking nuts secure the assemblies during transit, while allowing for fast fork removal on the assembly line. In sum, thanks to EGA returnable transport racks, the paint stays on the motorcycle components. The problems with shipping damage are long gone, along with the time and cost of protective packaging and subsequent disposal. Storing bicycle components that were awaiting completion or shipment wore out the patience of this leading manufacturer. The previous method of storing wheels, tires, and other components in rented trailers was very expensive, and it made retrieval a labor-intensive inconvenience. EGA custom engineered returnable racks introduced new efficiencies to their storage operations, with the company enjoying a one-month payback on its investment of 100 racks. Labor is less intensive now that the product is in the plant and readily accessible. An additional order of racks is now helping many other departments with their storage needs. When this Tier 1 automotive supplier specified a transport rack for their rear-suspension assemblies, they were precise. The racks needed to be both returnable and ergonomically designed to minimize worker fatigue.